If there’s one thing Pembrokeshire has plenty of it’s castles. Fifty-one mighty strongholds and romantic ruins are a prominent legacy of the turbulent history in this coastal region, here are just a few to get you started. 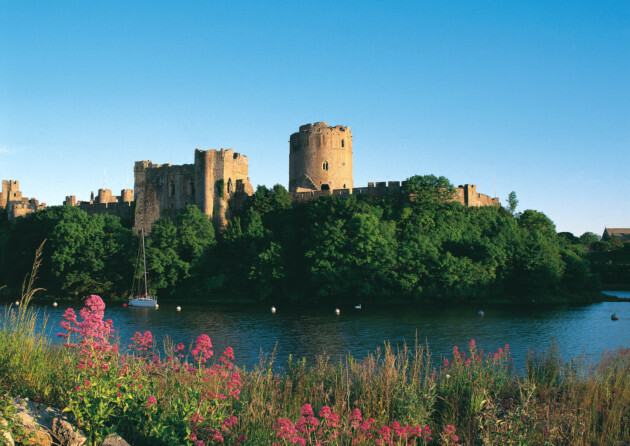 No visit to the Welsh town of Pembroke can avoid this striking fortress, which from the outside still gives the impression of being largely intact. Perhaps its most famous claim is as the birthplace of King Henry VII in 1457, and it is within the walls of this castle that many important chapters of Britain’s medieval history were written. Built in 1090 by Arnulph de Montgomery, Norman conqueror of Pembrokeshire, the castle didn’t have long to wait until its defences were tested during a long siege by the Welsh in the 12th century, which severely tested the stamina of its English defenders. Nowadays life at the castle takes on a very different form. Its history is celebrated by its latest owners, who help to bring to life some of the typical characters that shaped its destiny, through ‘living history’ days, guided tours, story telling and staged events. There are exhibition rooms housing replica models, paintings and audio sequences which relay poignant moments in the castle’s history. Wander through labyrinthine passageways and alleys, climb to the top of the 75ft high Great Keep for privileged views, or descend the spiral staircase into the vast limestone cavern that lies beneath its foundations. With sea views, pretty gardens and a position well sited to ward off threat and smite enemy attack, this Norman castle is one of the county’s most romantic buildings – made more so for those lucky enough to stay in the holiday cottage within the castle walls. Once there, guests can explore the property at leisure, walk into Manorbier village or stroll the short journey down to the beach. The fortress, a single rectangular ward with no keep, was built in the 12th century by Odo de Barri, a Norman knight whose efforts in seizing Pembrokeshire during the Conquest were duly rewarded by the donation of local land, including Manobier. For such an aged building the ruins are just intact enough to resurrect in the imagination, but unlike many local strongholds, Manorbier escaped major assault, suffering just two incidents in its history. The first came in 1327, when a member of the de Barri line stormed Manorbier to claim what was rightfully his, and, then, in 1645 during the English Civil War, when the castle was seized by Cromwell’s Roundheads. Today’s more welcome visitors are treated to the spectacle of life-size wax figures in period dress throughout, in the Great Hall, the chapel and the dungeon. Re-emerge from the depths and head out into the immaculate gardens, designed by respected plantswoman Daphne Shackleton. Labelled as Pembrokeshire’s finest historic house and gardens, Picton is a combination of fortified manor and medieval castle. From the outside it looks impressively formidable with its striking roundtowers and turrets. Once behind closed doors however, the anticipated inner courtyard of the typical castle is found to be a series of rooms firmly in keeping with a stately home. The lavish house was built by and belonged to the revered Wogan family during the 13th century. John Wogan was Justiciar of Ireland and wanted a home to match his credentials. His direct descendants are still in residence today: the Phillipps family were the county’s most powerful family during the 17th and 18th centuries and had great political, social and economic sway for the benefit of the local area and communities. The castle grounds are equally well kept. Forty acres are divided up into woodland and walled garden where you can walk at leisure through scented paths of rose, rhododendron, magnolia and camellia or lose yourself in the trees. The month-long Picton in Bloom is celebrated each year with a wealth of horticultural events such as plant fairs. Few places command such presence as Carew Castle. For over 2,000 years its foundations have held secrets of civilisation which archaeologists believe to have begun during the Iron Age. Roman relics have been unearthed here too, and research shows that the site was occupied continuously up until the arrival of the Normans. The Carew Cross is one of the most prominent features, placed at the castle entrance in memory of the 11th-century ruler of south west Wales, Maredudd ap Edwin. Prior to this time, it is thought that ancient Celtic royalty once dwelled on this strategic riverside site. The castle began as a Norman motte and bailey, which by the 1200s was replaced by stone by Gerald Fitzwalter of Windsor. His son William modified his father’s work, creating a stone wall enclosure incorporating the keep and a Great Hall. In recent years Cadw, the historic preservation body for Wales, has mustered the funds to keep the castle secure for future generations. During a visit, take the circular walk to the nearby 19th-century Carew tidal mill, the only one of its kind in Wales. Guided tours of the castle site are available over the summer season and if time allows, bring along a picnic to this especially scenic corner of Wales. Narberth Castle. © Cadw, Welsh Assembly Government (Crown Copyright) all rights reserved. This crumbling ruin may appear to be struggling to stand in the 21st century but it is nevertheless exemplary in terms of survival. Built to replace a poorly sited Norman stronghold known as Sentence Castle, Narberth first emerged in the 14th century and its structure was continually added to in later years – prior to this it is thought to have been the site of an ancient palace. Sir Andrew Perrot, a Norman knight, laid the foundation stone of the castle seen today in 1346, but native armies were soon to test the strength of the fortress and its English occupants. When the last known occupant, Captain Richard Castell died around the end of that century the castle gradually fell into ruin. The barrel-vaulted kitchen cellars remain intact, and there are remnants of two of its four towers, but no rooms are complete. Yet this atmospheric site, which only opened to the public following restoration in 2006, should be visited if only to soak up its atmosphere and to consider the many associated legends. Cilgerran Castle. © Cadw, Welsh Assembly Government (Crown Copyright) all rights reserved. This 13th-century castle is yet another Welsh site known to have inspired creative talent, notably that of artist JMW Turner, and still today its position high above the Telfi Gorge is enough to draw visitors to contemplate the scenery, if not the events scored on its history books. The Norman nobleman Gerald de Windsor established a ringwork castle here at the beginning of the 12th century, yet little remains of this in place of the masonry castle built on top of the foundations later that century. Not long after the fort was built Cilgerran became the base of a scandalous event when in 1109, Nest, the Welsh version of Helen of Troy and wife of Gerald deWindsor was abducted by a besotted Owain, son of the Prince of Powys, an act which set all Wales aflame. As with many of the county’s fortresses, location was everything to evade capture from a hostile nation, and the fortress was especially hated by local people, who frequently attacked it, prompting Gilbert de Clare, Earl of Pembroke to fortify the structure with a stone curtain wall in 1169. However, in 1215 Welsh pride was restored when it was successfully taken and held for eight years during Llewelyn the Great’s campaign. Control continued to bounce between Anglo-Norman and Welsh forces through the 13th century. William Marshall, an Earl of Pembroke, would finally regain control and his sons went on to build two great round towers to compensate for the castle’s ‘weak’ spot – in other words a spot not flanked by a steep gorge! Their efforts were not enough to withstand the firepower of the Civil War however, and the several cannon balls from the fray have been found dotted about the site. Eventually abandoned and left to nature, the castle fell into ruins, but in 1938 the National Trust took responsibility for its upkeep, which it continues to do in conjunction with Cadw, the preservation charity for Wales.